This is the first book solely dedicated to the history, development, and present-day flowering of Chicana and Chicano visual arts. It offers readers an opportunity to understand and appreciate Chicana/o art from its beginnings in the 1960s, its relationship to the Chicana/o Movement and its leading artists, themes, current directions, and cultural impacts. Although the word “Chicano” once held negative connotations, students–along with civil rights activists and artists–adopted it in the late 1960s in order to reimagine and redefine what it meant to be Mexican American in the United States. Chicanismo is the ideology and spirit behind the Chicano Movement and Chicanismo unites the artists whose work is revealed and celebrated in this book. Jackson’s scope is wide. He includes paintings, prints, murals, altars, sculptures, and photographs–and, of course, the artists who created them. Beginning with key influences, he describes the importance of poster and mural art, focusing on the work of the Mexican artist José Guadalupe Posada and the significance of Mexican and Cuban talleres (print workshops). He examines the importance of art collectives in the United States, as well as Chicano talleres and community art centers, for the growth of the Chicano art movement. In conclusion, he considers how Chicano art has been presented to the general American public. As Jackson shows, the visual arts have both reflected and created Chicano culture in the United States. For college students–and for all readers who want to learn more about this fascinating subject–his book is an ideal introduction to an art movement with a social conscience. Jackson, Carlos Francisco. 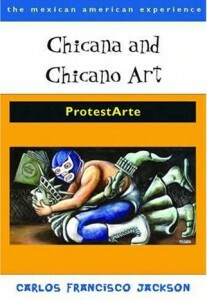 Chicana and Chicano Art: ProtestArte. U of Arizona P, 2009.